Another Barbie movie Barbie Mariposa and the Fairy Princess. It's the sequel of Barbie Mariposa and her butterfly fairy friends. Length of the movie is 77 mins. The story is delightful. A great entertaining movie for Barbie Fairytopia fans. Enjoy this great movie and let me know what do you think about it. How to Watch Barbie Mariposa and the Fairy Princess (2013) Barbie Film For Free No Download, No Surveys and 100% Free? 62 Responses to "Watch Barbie Mariposa and the Fairy Princess (2013) Movie Online For Free in English Full Length"
why isn't the movie loading ? Barbie: My Scene Goes Hollywood: The Movie (2005) has not been added yet and Anon, Barbie & Her Sisters in A Pony Tale (2013) is not out yet. It comes out in October. Anon, try reloading the page, it works fine here. Says it was removed. .. Seriously guys? If you really wanted to watch it, you should have come over here sooner. So stop complaining. And stop your whining. >.> Give Admin a break. It works fine. It has sound. It's there. Reload the page, it works fine here. Also be patient. I'm trying to watch and I keep reloading the page but the play button always has a cross through it. The movie's not uploaded yet ? 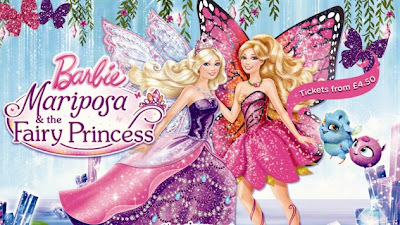 When can the movie barbie Mariposa and the fairy princess load up in this site ?! Why is there a cross over the play button it doesn't work. Does this one have in sync audio & video most of the videos of this movie don't around the mark where she gets told to leave. what the kind of Barbie was this?? Please add barbie as pearl princess as soon as you can. And when is it releasing??????? Great movie.... Mariposa n Prince Carlos are so cute! Anon, thanks for your comment and glad to hear all movies work fine. Hey!, it totally worked :'D. I'm a adult barbie lover, lol. and, ElsaFrozen : I likes Gnomeo and Juliet too. that was a great movie :). And. enjoy your time watching y'all :). i'll keep going, bye. Not working and it is written in a different language !!! Hi, I enjoy the free stuff, but the fact that the first video isn't working and how it's in Russian frightens me. Please try to fix this, or I will write very bad reviews. Only warning! i was watching earlier and it was working fine. i took a thirty minute break and when i came back it wasn't working. i am not able to view this movie. it is constantly buffering. the secret door wont even open. the only one i was able to watch was the pink shoes.